Whooo-ooo Train's a' coming James can't wait to get on board and go visit his uncle way up north in New York City. But he also just wishes he could take a little bit of home along with him-things like baseball games, and the special birthday cake Mama always makes. Will Uncle Romie, who's some kind of artist, know about things like that? Young readers will feel as if they're discovering the city's wonders, and making an unexpected friend, right along with James in this vibrant story, expressively illustrated by Coretta Scott King Award winner Jerome Lagarrigue. A how-to section on storytelling collages and a short biography of Romare Bearden are included. Claire Hartfield is a native and lifelong resident of Chicago, Illinois. She attended the public schools of Chicago, received her B.A. from Yale University, and her law degree from The University of Chicago. 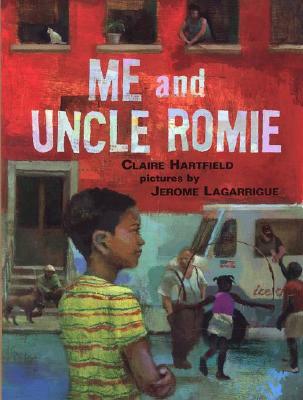 Claire is the author of the highly acclaimed Me and Uncle Romie which was chosen as a Notable Book of the Year by Smithsonian Magazine, a Junior Library Guild Choice, and one of New York Public Library's 100 Books for Reading and Sharing. The story is historical fiction, based on the life of renowned African-American collage artist, Romare Bearden. One of Claire's greatest pleasures was raising her own three daughters, Emily, Caroline and Corinne. It was through reading to her girls that she experienced first hand, the ability of books to transform a child's understanding of the world and their place in it. The magical and powerful role of books in the life of children drew her into writing. In addition to her writing, Hartfield is an attorney and education leader with particular focus on helping to provide educational opportunities to under-served children. She has served as Chief of Staff, Chief Operating Officer, and is currently Chairman of the Alain Locke Charter School on Chicago's African-American West Side. During Claire's tenure as a member of the leadership team, Alain Locke Charter School has achieved the #1 test score gains in the history of the Illinois Standardized Achievement Test and has been recognized by the U.S. Department of Education as 1 of 7 schools in the nation best closing the achievement gap. Claire has also led Alain Locke's programs to identify and develop principals and teachers for urban schools around the country.Prior to her work in charter schools and education leadership development, Claire worked as a lawyer, specializing in school desegregation litigation, using her legal skills to negotiate equal educational opportunities for those who historically have been relegated to inferior schools. Claire is currently continuing her work with Alain Locke Charter School and is working on a new book for children.